Everything was good. No noise from the club as i was on the 6TH floor. Good cleaning staff The philipino male front desk staff was excellent. Near to Metro The only negative is the Internet. Wifi was not consistent but still not bad. WE BOOKED ON AUG 31-SEP 1 DURING THE EID HOLIDAYS. GOT THE ROOM FOR A VERY REASONABLE RATE SINCE WE BOOKED IT ABOUT A WEEK IN ADVANCE. WE REQUESTED THE TWIN BED ROOM. THE BEDS WERE QUEEN SIZE EACH ALLOWING FOR A VERY COMFORTABLE SLEEP. ONLY THE HAIR DRYER IN THE BATHROOM NEEDS TO BE UPDATED/CHANGED SINCE IT'S SO OUTDATED AND LOOKS LIKE A VACUUM CLEANER NOZZLE. WIFI CONNECTION IS GOOD. THE POOL WAS ALSO GOOD AND THE PROVIDE TOWELS. THE BREAKFAST WAS OKAY, THEY HAD COFFEA, TEA, BOILED EGGS, HOTDOGS, POTATO WEDGES, BREAD, A FEW VEGETABLES FOR SALAD AND FRUIT JUICES. CHECK IN AND OUT CHECK OUT WAS ALSO A BREEZE. THE STAFF IN THE RECEPTION WERE PLEASANT AND ALWAYS GREETING YOU WITH GOOD MORNING OR GOOD EVENING. EVEN ONE HOUSEKEEPING GUY WENT OUT OF HIS WAY WHEN WE TRIED TO FIND THE POOL ON THE 6TH FLOOR WE SAW HIM IN THE HALLWAY AND ASKED HIM FOR DIRECTIONS. INSTEAD OF JUST POINTING OUT THE DIRECTIONS, HE EVEN CAME WITH US UNTIL THE POOL AREA. LOCATION IS VERY NEAR RIGGA METRO STATION JUST WALKING DISTANCE, AND LOTS OF SUPERMARKET AND RESTAURANTS NEARBY. ALL IN ALL NOT A VERY FANCY HOTEL BUT NOT TOO BAD EITHER. Excellent Location, Good Ambiance, Neat and clean. Central location, co operative staff, good amenities. Only quality of breakfast needs to improve, shortages of plates, cups, spoons was happening. Bath water was warm not hot, setting for temperature switch shall be available in individual room. We enjoyed our stay and the hotel as described. Worth noting that the hotel does have a pool and hot tub on the roof, it’s nice and hardly signposted, you’ll doubt it’s even there. There’s also a gym. The breakfast was a bit too basic. Could have been some fruit at least or cereal. I was looking for budget accommodation and that is what I found, but a few serious issues, first you cannot walk down the street without being offered massage from some Chinese guy irritating to say the least. Then as most reviews have mentioned staff is not very friendly but almost efficient, porter insisting on taking bags, rooms are old and poorly maintained, for my room water was hot and AC was way to cold even on minimum speed and 25 degrees I had to sleep with socks and polo on. Breakfast is funny ( best way to describe it) And you have the clubs 5 rooms in the hotel are used for club at night and it is F..........ng noisy as hell. We had a wonderful stay. Hotel has good location near Metro. Breakfast was good, Swimming Pool Attendant was so warm, kind & helpful. Rooms need repair though. Old Carpet, Bathroom shower pours much water on the floor & old furniture. Only negative is that the Pool is a useless facility because it's only open between 9am and 5 pm. If you wanted a Resort you wouldnt come here anyway. Tourists and Business people want a relaxing pool after a busy day. I would have given hotel a higher rating otherwise.Everthing else is Positive! Staff are courteous and efficient, with a few exceptions probably due to lack of English. 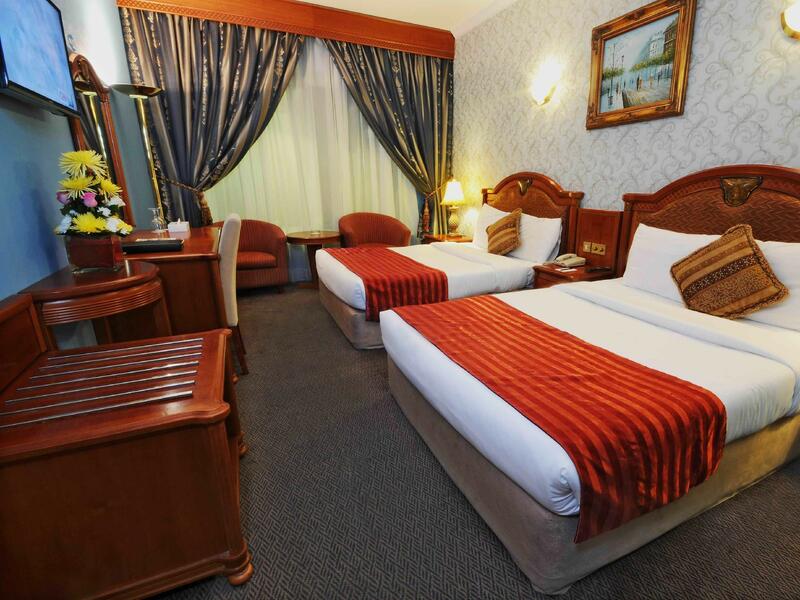 Very clean and comfortable room and great beds in Twin. An electric kettle is supplied upon request, as are many other handy extras. 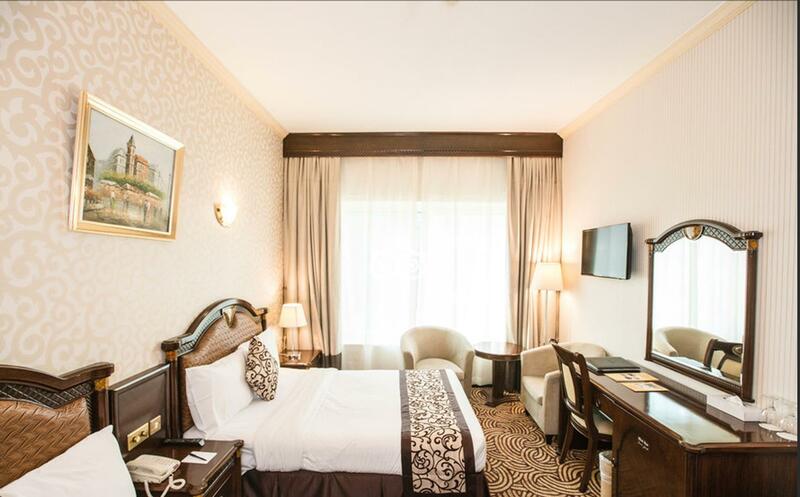 Conveniently close to Metro and public transport and Reception will happily call for a taxi. There are 5 differnt Nightclubs in hotel but i was not disturbed by any noise on the 4th floor. Nearby local grocery shop and about 15 minutes walk to a large Western style shopping mall, with a fabulous "Fridays" eat-in/take-away Western and Eastern eatery right outside of it. I would recommend this hotel with pleasure. Very dirty rooms, narrow underground car parking, I didn't manage to sleep because of the noise coming from the night club in the hotel. In addition, the pictures which has been uploaded taken when the hotel was new and clean. Therefore I don't recommend to stay in this hotel. 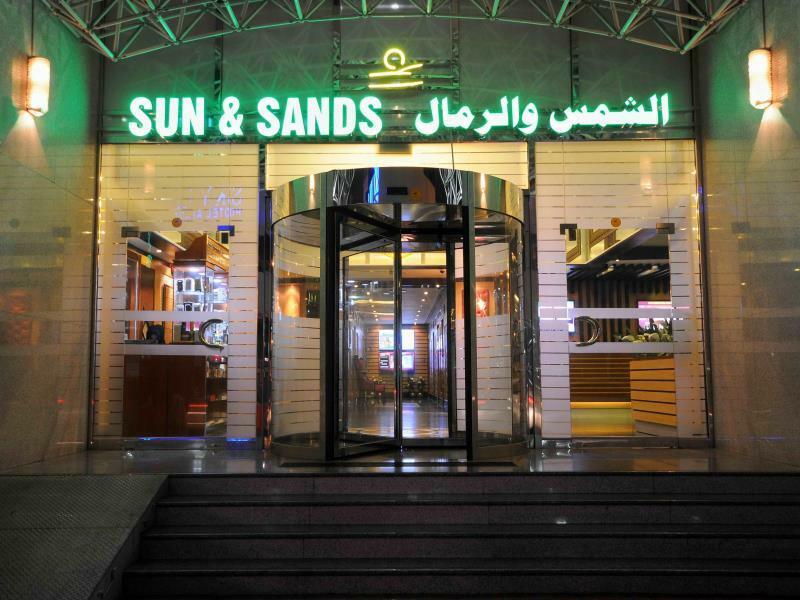 Location next to Al-Rigga Metro Stop, Bed was a good size, Staff were brilliant. My stay was brilliant. 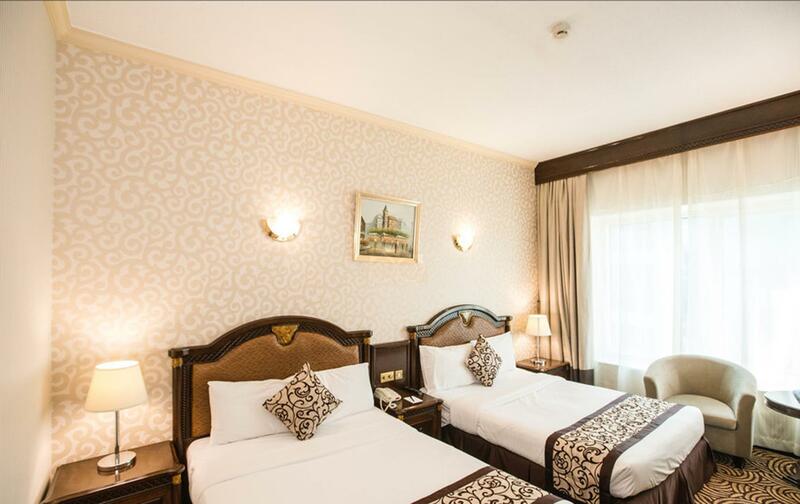 The hotel is conveniently located near a metro station from where you can travel all around Dubai. Very good value for money. Will not recommend breakfast as not much variety, however a lot of cafes/restaurants nearby. Had a pleasant stay at this hotel. With the exception to the noisy construction site nearby i got value for the money spent. The in-house restaurant could do a bit of improvement and actually have whatever they show on the menu. The room (deluxe) was spacious and clean with free wifi. All in all it was good. It's too bad my friend she want to visit me they say no not allowed in my room and am trying to calling agoda but can't I booked for two night I arrive at night I stay one night and I want to cancel the other night they say can't be ?????? Pros: near to metro station, roof top swimming pool, cheap room rates with basic breakfast Cons: sheets and towel smells bad, no slippers, no kettle, no toothbush and toothpaste,the people on the other room was very noisy so we didn't slept well, staff wasn't friendly or accommodating at all. สถานีรถไฟใต้ดิน Al Rigga - ระยะ 0.23 กม.